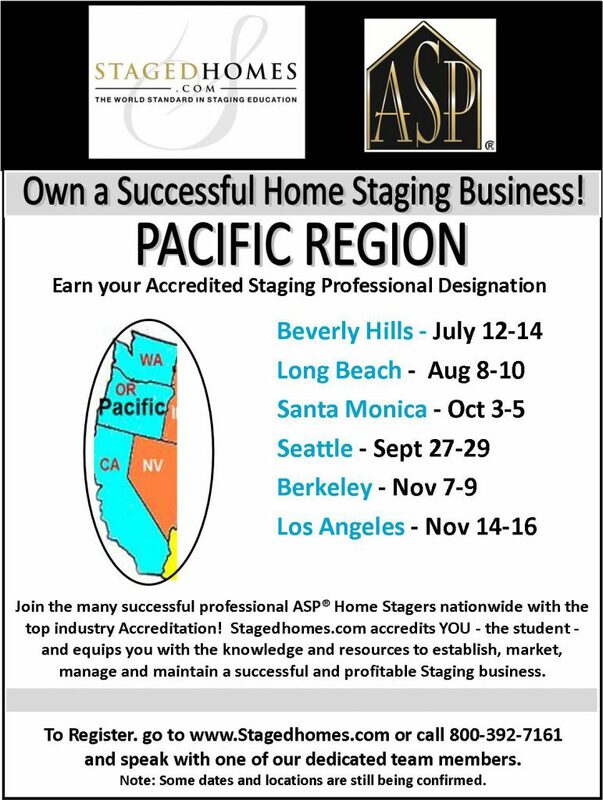 Home Staging Business Course coming to the Pacific Region! Want to start a successful Home Staging Business? Or do you need to add Home Staging credentials and expertise to your existing interior design or decorating business? Register for one of our upcoming, cutting edge Home Staging Business Courses! The Accredited Staging Professional (ASP) Course is the most thorough and longest running training course with successful Home Staging business owner graduates throughout the world. Join the ranks of professional Home Stagers that own and operate lucrative businesses and gain the foundation you need to succeed long term in this industry. All graduates receive a one year complimentary membership in the International Association of Home Staging Professionals (IAHSP – www.iahsp.com). For more information go to www.Stagedhomes.com or call 800-392-7161.